Our panel of East End home experts talks about the advances in style—and surveillance—they've seen so far in 2018. 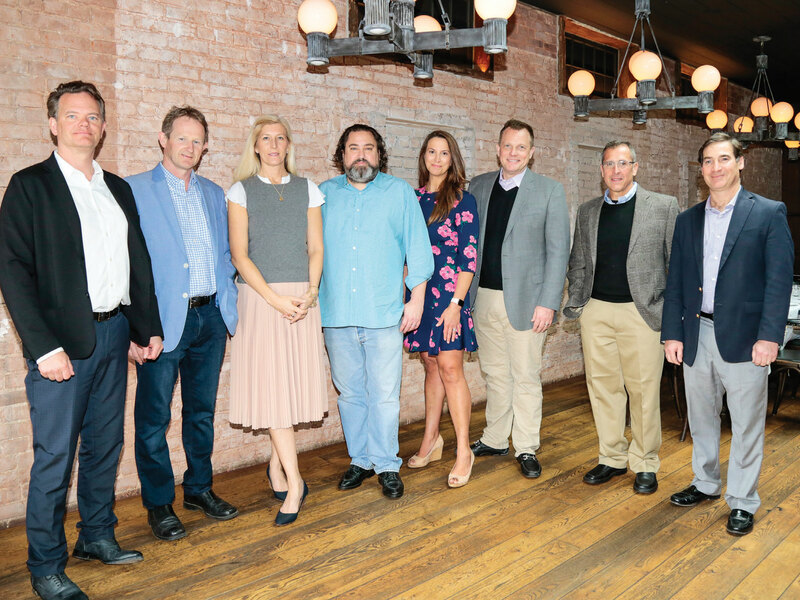 Panelists (from left): Nick Martin, Declan Blackmore, Sally Spanburgh, Carter Burden, Sarah Minardi, Patrick McLaughlin, Greg D’Angelo and Philip O’Connell. Wearing their thinking caps, this week’s creative crew—architect Nick Martin, builder Greg D’Angelo, landscape designer Declan Blackmore, interior designer Sally Spanburgh, smart-home master Carter Burden and real estate pros Patrick McLaughlin, Sarah Minardi and Philip O’Connell—ponders the latest design innovations. So what are the prevailing trends? SARAH MINARDI: Not having a vast open space; making delineations between the dining room, kitchen and living room while still keeping it open for easy flow. DECLAN BLACKMORE: Less lawn, more meadows, native sculptural plants as statements—less complicated, more sustainable. SALLY SPANBURGH: Those organic, natural materials are coming inside as well. A lot of texture. Also lighting as sculpture. Window treatment-wise, everything is cordless. Things are quieter and easier to operate. PHILIP O'CONNELL: That delineation between outside and inside is really being broken down. What looks like traditional from the outside, from the back, it just opens up. SM: The doors that fold into one another and back into the house. GREG D'ANGELO: From a construction point of view, is all of this glass? Where do you put the light switches? Instead, you need a keypad. There are lights you can only turn on with the phone, or there’s a touch screen. That’s the way of the future, and it’s really simple and economical. It’s becoming the reality of construction. CARTER BURDEN: You can do keypads easily with micro-controllers that also give you the flexibility of using different types of cosmetic switches. There are many options for keypads at not a huge expense. SS: Companies now have a sabbath feature that completely shuts down their electronic mode, so it doesn’t cross a religious boundary. GD: One of the coolest things is the placement of the TV. Can we hide it? Does it go over the mantel? They made options like a TV in a mirror—that’s ridiculously expensive, and the picture is affected. Samsung makes a cool product called Frame. It looks like a painting. CB: There are no bezels anymore, so the picture takes up the entire screen. Somebody might have an old 49-inch TV, and you can squeeze a 55-inch in the same location. GD: As implementers, we struggle with design. I appreciate that the technology is making it easier to get things done. 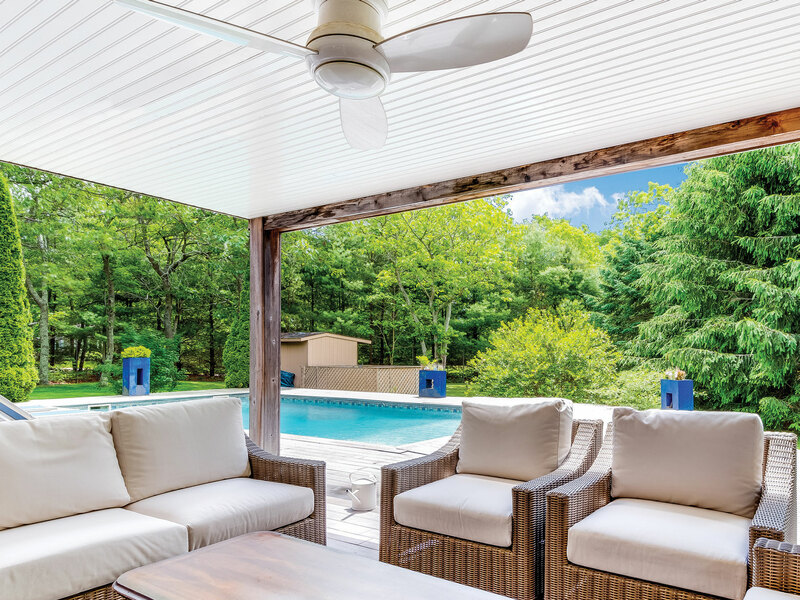 Smart home technology makes it easier to control your home’s energy usage from wherever you are, as in this beauty by Greg D’Angelo Construction. How has modernism evolved out east? NICK MARTIN: Modern architecture has changed largely on the waterfront, because of the FEMA laws. The elevations have all changed. The typical traditional house of yesteryear was two-thirds roof. You can’t do that anymore, so automatically there’s a certain scale. PATRICK MCLAUGLIN: A finite number of people actually want a modern home. Sometimes people are reticent because they feel modern ages quickly. NM: It’s about the quality. The ’80s is full of copycat architecture that didn’t age well. PO: Some of the current modern is timeless. But modern is ever-evolving. SM: The amount of people that want a modern home has grown. 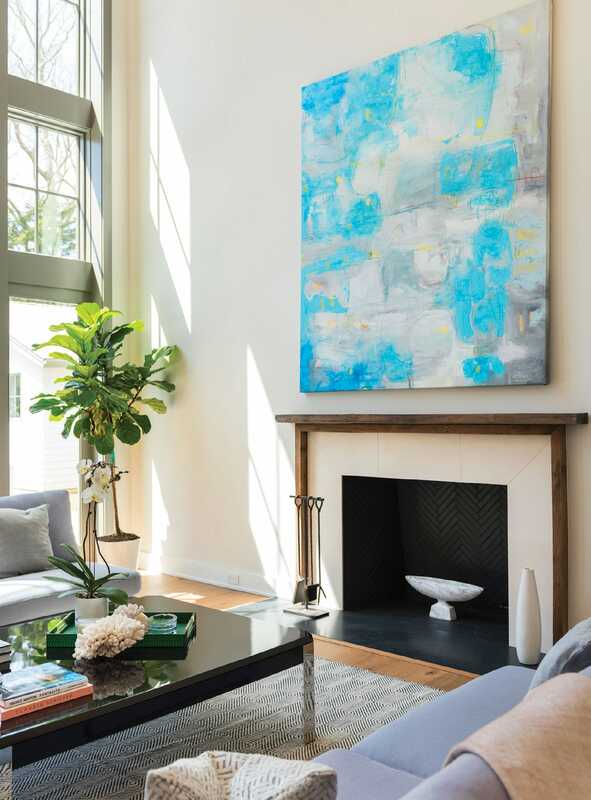 They want open flow, big windows—not closed-in rooms, which we’ve seen in the transitional style, where it’s less about strict modern rules. SS: I love that there’s such diversity in our houses, even in the interiors. You find a modern with a ’70s vibe inside, and you find an 1840s with a modern interior. CB: I wonder if many of the beach houses to be built over the coming years will arrive at a very similar design idea based on maximizing space and satisfying the code. NM: I’d say half the people interested in modern want a brutal modern house, and the rest a unique, warmer version that represents the way they live. 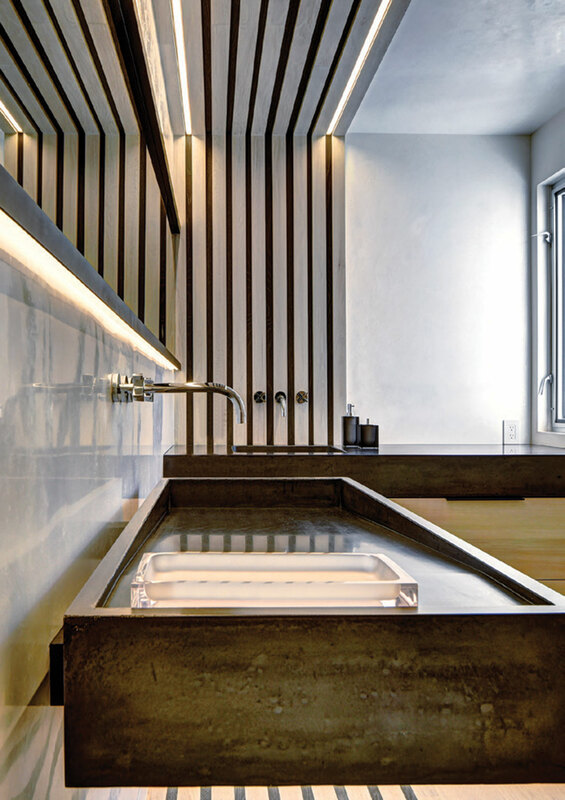 Contrasting white and ebony woods create a “rainscreen” over a floating sink in this bath by Martin Architects. How about colors, textures and shapes? SS: So many organic shapes. And the colors are still neutral but with lots of color in the art or accessories, a lot of texture, a lot of color banding. DB: We’re using less color. Years ago, something had to be in color at all times. If you went three weeks with nothing in flower, you were a bad designer. That’s not the case anymore. There’s more emphasis on texture. In the past, we might have overcomplicated it. PM: I hear texture a lot, and deer-resistant. 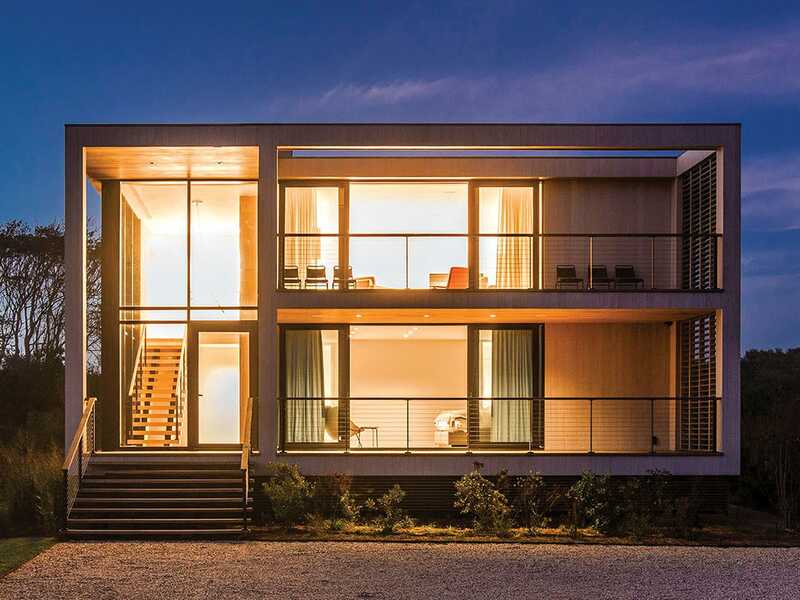 A glass wall allows light to flood this Saunders property in East Hampton. How do you design for young families? SS: Cordless, durable, washable, changeable. Customers make slipcovers for their slipcovers. PO: Even though people want an open space, young families also want a cozy, intimate space. SM: The toys can go in that location. PM: When I was a kid, parents wanted the kids on the other end of the house; now they want to be close to them. DB: Parents want kids involved in growing vegetables. We also get asked for soccer fields, kickball courts, bocce courts—designing into the landscape to keep kids occupied. The trend is more lawn area, less chemicals. People want enough grass for kids, but the rest as meadow and native grasses. DB: There are ways to make it fun. We’ve created bamboo teepees and get beans and peas to grow up them. Kids can go underneath. PM: The open kitchen that comes into the family room. SS: Clients getting information, taking time to do it well, and getting people who’ll do it well. 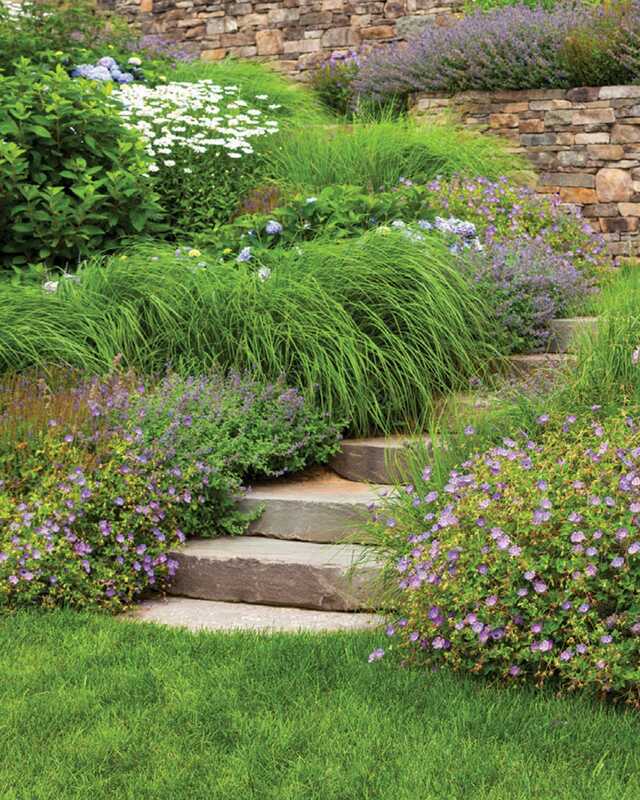 Graceful natural plantings by Summerhill Landscapes. PM: I had two houses do a charging station in the garage. Speaking as someone who has a Tesla and just put one in, it’s a nice little add. NM: Tesla is a year and a half out from charging independently from the grid. They do a power wall, and it charges the house. GD: Companies package heating and generating units to make each house independent. PM: One last tech thing is video monitoring. Everybody has a monitoring system now. SM: So they can see when vendors come in, how long they’re there, how long they’re actually billing for. It’s very interesting.